For patrols that require high- or low-volume gear storage and organization, the Falcon features 4000 cubic inches of storage space that will compress down to when carrying smaller loads. Designed for military mountaineering, the Falcon’s comfortable, adjustable suspension is designed to carry heavy loads over rough terrain. Keith designed a pretty awesome pack, but missed a few key points here! As an avid backpacker and United States Infantry Marine, i believe I have enough experience to speak on the issue and hopefully kelty will take a serious look at my few complaints. -The buckles and other headwear are not sturdy enough for serious abuse. Military rucks need to have durable hardwear. They get thrown around and beat on, and the flimsy hardwear on the pack currently is prone to cracking and being br Ken when being moved in and out of armored vehicles and aircraft. Lots of opportunities to snag and hang up there! -Dated waist belt hardwear! It is true that nearly every high end pack manufacturer has swapped to the much easier to tighten front pull waist buckle, including kelty on many of their civilian packs. Why not on this one kelty? 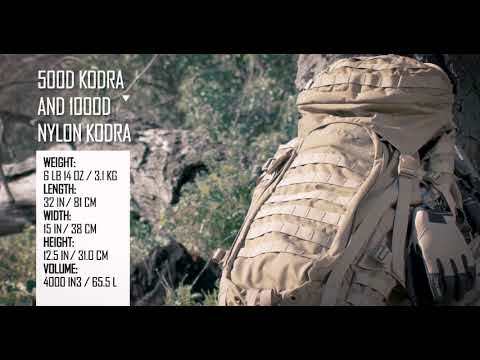 That is a key feature that makes life a million times easier, especially when trying to work around other gear, like a plate carrier, weapon, and a thousand other pouches. -more rigid waist belt and much more substantial lumbar pad. These would make the ride of the pack so much nicer under a heavy load. A thicker lumbar pad also helps compensate for the fact that your rear SAPI plate is pushing the pack away from your back, and would make the pack a thousand times more comfortable with kit on! -a couple more compression straps. This is probably my most minor gripe about the pack. I use this pack as a main ruck, but also have flexed it into the role of and assault pack. Having an additional compression strap across the middle of the pack, and two that connect to the bottom of the suspension and connect about midway up the front of the bag would make securing a smaller, but still dense combat load much nicer! Just received my pack and it is everything the other reviewers say... Very rugged and well made! It has more usable/packable space than a very expensive high end 70 Liter elk hunting pack that I recently purchased and returned. One HUGE Plus (pun intended) is that the waist belt expands enough to fit fat guys! 1). No PALS webbing on the right side of the waist belt (very hard to see in the photos) for mounting a pistol holster and GPS pouch as I am right handed and plan on using the pack for back country deer hunting. 2). Color(s): I wish O.D. Green was available as opposed to Coyote Tan and the same with the rain cover... Coyote Tan and White, these are the perfect combination of colors to get SHOT in the woods.during deer season!!! I will either have to wrap and orange vest around the pack or purchase a reversible camo/orange rain cover for use during deer season. 3) The pack needs another set of rear vertical compression straps or a set of strap connection loops on the rear bottom and extra straps so that one can compression strap down a jacket under the main pack cover and then strap down rain gear between main pack cover and the removable top unit. Overall I am very happy with my purchase and am looking forward to using it soon.